Our Arizona luxury vacations feature something for everyone. From the saguaro-studded expanse of the Sonoran Desert to the green, pine-filled mountains of Flagstaff, and the roaring waters of Havasupai Falls, Arizona is a land of seemingly-impossible diversity. Relax for a well-deserved soak in the swirling, mineral-rich waters of a natural Jacuzzi tub after a long hike. Learn the story of the “Two Brothers,” the stone pillars perched above the village of Supai, before mailing a postcard from the village post office – the only remaining site in the U.S. still delivering mail by mule train. Explore the red cliffs of Sedona, bike to Tuzigoot National Monument, and discover Sunset Crater Volcano National Monument. Savor the buttery hues of an award-winning Arizona chardonnay and top off your day with a refreshing swim under a desert waterfall or sipping a frosty ice cream float at the Snow-Cap Drive-In along Historic Route 66. Arizona by the Seasons: When is the Best Time to Visit Arizona? Many people think of the words “hot” and “dry” when they conjure up an image of Arizona, but in reality Arizona’s climate varies widely according to altitude. 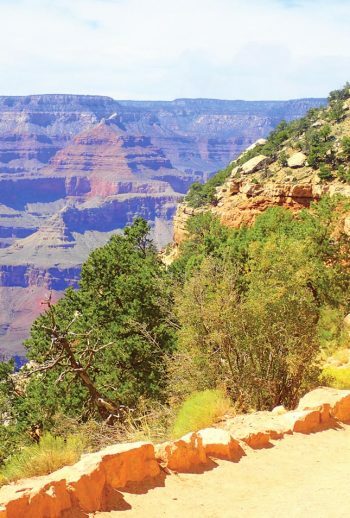 Southern Arizona (Phoenix, Tucson) experiences very hot summers and warm winters while Northern Arizona (Flagstaff, Sedona and the Grand Canyon) will see four distinct seasons, although any time of the year is mild enough for a visit. On an Austin Adventures Arizona Adventure, you’ll likely fly into Phoenix but will immediately head north to milder weather. Summertime temperatures can vary greatly depending on where you are during the hottest part of the season. Southern, Arizona is hot, hot, HOT seeing high temperatures in the 100F+ range and lows in the 80s. In this kind of heat, most of our guests either hang out inside or head out to the pool (wear your sunscreen!) June – August is the “value season” in Southern Arizona while Northern Arizona enjoys its “peak season”during this time frame. Up north, you’ll find highs in the 80s and lows in the 50s – just perfect for an active vacation! The fall season starts out warm in September (especially in Southern Arizona) but will drop down considerably over the next few months. Later in the season, the south starts to see some nice temperatures in the 60 to 70°F range. It will get colder up north, averaging anywhere between 40 to 60°F for a high, but it’s not so cold that you can’t take in the sights by foot! Depending on where you travel, you may even come across some snow later in the season. After all, places like Flagstaff and the Grand Canyon average about 7,000 feet in elevation! We would consider winter in Arizona quite pleasant for the most part. Southern Arizona experiences its peak season at this time as tourists flock to the warm temperatures, attempting to escape the snow across the rest of the US. The high’s in Phoenix at this time land in the 60 to 70°F range ah, perfect. Northern Arizona will definitely be colder as you head up in elevation, but the winter temperatures (highs anywhere between 40 to 50°F) are quiet pleasant in the height of the day. Lows can be below freezing so there’s a possibility of snow – dress warm! Wondering How to Prepare and What to Pack on Your Arizona Vacation? You can travel to Arizona at just about any time of the year and enjoy an adventure vacation. So, your main question might be: what do I pack? While our detailed pre-trip planner will give you the specifics, read on for a few tips from our adventure travel professionals on what to pack and how to prepare for your Arizona Adventure. Since it’s pretty warm at most times of year in Arizona, you’ll want to be sure to pack lightweight clothing (shorts and T-shirts) to maintain a cool body temperature in the heat of an active day. However, you’ll also want to bring along a few extra warmer layers as it can be cool in the mornings, evenings and nights! If you’re traveling anytime between late October and early April in Northern Arizona, you may want to bring a warm jacket or fleece, gloves, a warm hat, mid-weight long sleeve layers, warm socks and long underwear. Pack Your Raincoat, Especially During Monsoon Season! Arizona’s monsoon thunderstorms take place from mid-June through the end of summer during the height of our peak season. Monsoons in Arizona typically bring higher humidity, wind storms, dust storms and periods of heavy rains. Be sure to pack your raincoat in your day pack and make it easily accessible. Thunderstorms are especially common in the afternoons and develop quickly. Luckily we’ve usually completed our activities for the day and are enjoying ourselves back at the hotel by the time a storm hits. In the case you get caught in a thunderstorm during an activity, your guide will direct you to the safest area to wait out the storm. Whether you’re heading out on our Havasupai Adventure or our Grand Canyon Vacation, you’ll want to be sure to bring a comfortable daypack with chest and waste straps. For adults, we recommend a backpack in the 24 to 38 liter range (1,500 in. 3 to 2,300 in. 3) For kids: well, a small pack, but we find that parents usually end up carrying a lot of their “stuff” on any given hike! You’ll want to make sure you have enough room for plenty of water, sunscreen, and your camera. You also may shed layers throughout the day or have to bring a lunch, so don’t forget that you’ll need extra room for these items. 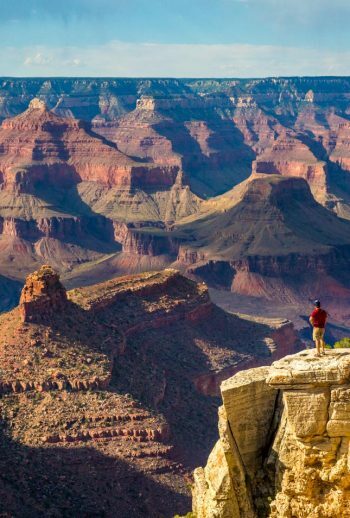 Austin Adventures Arizona trips run from the beginning of the spring through the end of the fall and take place in or near the Grand Canyon at an elevation of 7,000+ feet. Many of our guests travel to Arizona from sea level (or near that) and find that activity is more difficult at this higher elevation. To prepare for this change, make sure to practice any kind of exercise routine (walking, running, cycling, fitness classes, etc.) to ensure you feel comfortable taking on an active vacation. The more physical you are before your trip, the better prepared you’ll feel, even with a change in elevation! Arizona is a fascinating state in the southwest that deserves some time to be explored at any time of year. When and where you go in this large state will largely determine how you go about planning your trip. Below, you can read a few insider tips from our knowledgeable team, and if you want to know more – just give us a call! It can be HOT in Arizona in the summertime and it’s easy to fall victim to a heat-related illness if you don’t follow a few easy tips. First of all, drink more fluids than you normally would, ESPECIALLY during any outdoor activity. If you become thirsty, you’re already dehydrated. In order to avoid this, constantly sip on water throughout the day and drink lots of water after a strenuous activity. Also, you’ll want to steer clear (or enjoy in moderation) beverages containing alcohol, caffeine or large amounts of sugar (these can dehydrate your body!) Also, limit your outdoor activity during the hottest part of the day when the sun is at its peak intensity. 2. Phoenix: in the Heat of the Summer. When it comes to flying into Arizona, Phoenix is our city of choice, and while it’s going to be muy caliente mid-summer, there’s a myriad of things to do inside that will keep you out of the heat but having fun. There are any number of water and splash parks if you want to get your soak on. You can also check out the Phoenix Art Museum, Arizona Science Center, or the Mining and Mineral Museum if you’d rather find a little intellectual stimulation. You can even hit up a Broadway production at the Orpheum Theater downtown or catch an Arizona Diamondbacks baseball game in the comfort of a closed, air-conditioned ball park. Full Speed Ahead – Grand Canyon, Here We Come!